In the beginning, it was a dream – just a dream to transmit to their children and their children’s children, the heritage of generations, as all Jews have done from time immemorial but as Herzl said, ‘if you will it, it is no dream.’ And so, on November 10, 1904, fifty-four men petitioned WH. Felton, Jr., Bibb County Superior Court Judge, and were granted a charter incorporating Congregation Sha’arey Israel. Initially, services were held in rented halls, until a large two-story house on the comer of Oak and Third Streets was purchased for $5,000. Used for services and classes, it also housed the Rabbi and his family. In those early years, the City of Macon gave the congregation the land on Rose Hill for a burial ground. That land is the old part of our present cemetery. The oldest tombstone there is dated 1902. Rabbi Charles Glyck was here during most of the early years, serving our congregation intermittently until his death in 1923. 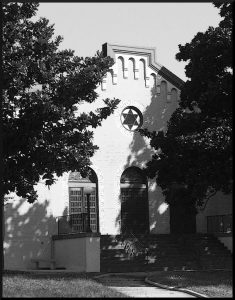 In 1919 the property on the comer of Plum and First Streets was purchased for $7,000 for the purpose of building a synagogue. Beginning with a fund of $6,000, the forty members of the congregation raised $23,000 among themselves. The building was completed in 1922, and on June 4th of that year a dedication ceremony was held. The officers of the congregation were: Hyman Marshall, president, Emanuel Gordon, vice-president, Harry Gordon, secretary, and Adolph Phaul, treasurer. Members of the Board of Governors were: Bernhardt Goldgar, L.E. Schwartz, H. D. Kaplan, Louis Snyder, and Jake Backer. In the same year the women of the congregation officially formed the Ladies Auxiliary at the home of Mrs. H.D. Kaplan. The first president was Mrs. B.M. Goldgar. Throughout the history of the congregation, the Ladies Auxiliary played a most active role in financial and spiritual affairs. From 1922 to 1947 the congregation grew rapidly and religious school enrollment increased. Yet, there were many times that we were without the services of a rabbi. The first bulletin was published by the Congregation in October of 1940. An adult Bible class, conducted entirely in Yiddish, was held. During the war years servicemen stationed here were entertained and public Seders were held by the Ladies Auxiliary. The Auxiliary also adopted two French war orphans and gave them aid until 1950. In 1947 Rabbi and Mrs. Charles Rubel came to Macon and the first Confirmation Class was presented. In December of that year a joyful meeting was held to celebrate the United Nation’s resolution to partition Palestine, creating the State of Israel. In 1948, the two houses on First Street, next to the synagogue, were purchased for $15,000. In 1949, the congregation affiliated with the United Synagogue of America, and adopted for use the Silverman Prayer Book. The Auxiliary joined the National Women’s League. The campaign to build a center was started in 1950 under the administration of Sidney Backer. For the first time the congregation elected an Honorary President, Hyman Marshall. In 1952, the Ladies Auxiliary was represented on the Board of Governors by its president, Mrs. Mose Scharfman. In 1953, during the administration of Isidore Goldman, the center was completed. It contained a large auditorium with a stage, a kitchen, ladies lounge, rabbi’s study, library and five classrooms. In 1954, during the administration of Izzie Chanin, the Men’s Club was created with Dr Hyman Katz serving as its first president. The Auxiliary changed its name to Sherah Israel Sisterhood. Rabbi Rubel left Macon in 1958 and was followed by the arrival of Rabbi Morton A. Wallach. Also in 1958, Milton Marshall was elected president, making the first father and son ever to serve in this capacity. 1958 also marked the first time a woman, Mrs. Henry Koplin, was elected to the Board of Governors. In addition, in 1958 air conditioning was installed in the sanctuary. In 1959, only six years after the center’s completion, we were able to burn the mortgage. In 1960, the newly adopted Constitution and By-Laws of the congregation granted wives the right to share their husband’s vote. In January of 1960, Joe Oliner was elected president and served in that capacity for eight months. Joe Levine followed and in 1961 long time treasurer Harry Schwartz was elected to serve as president. Congregation elections were changed from January to May. The first Bat-Mitzvah was held that year and in 1962 Dr Pierce Annes came to Sherah Israel to serve as Rabbi. In April of 1965, during the administration of Dr Hyman Katz, a total remodeling of the Sanctuary and basement took place. The Plum Street Foyer and the Barnett Chapel were added. The congregation pledged almost the entire sum of $110,000. By December of 1970 the note for remodeling the Synagogue was paid in full. During the 1965-66 administration of Melvin Kruger, a new cemetery was purchased at Rose Hill. During the 1966 administration of Harry Chanin the Religious School began teaching the Sephardic pronunciation of Hebrew. In 1968, Morris Cohen began a two-year term as president followed by Myron Koplin who served for one year. In 1971, Dr. Annes retired and was given the title of Rabbi Emeritus. In 1971 and 1972, Louis Chanin served as president. In 1971, during Hershene Goldman’s term as vice-president of the Sisterhood, the Journal yearbook was introduced. That same year the first woman, Beverly Kruger, was elected as an officer and served as treasurer. In 1972 a Torah Dedication was held in memory of Mose Scharfman and the Rabbi’s Study was remodeled. Rabbi Leo Heim came to our pulpit in 1973 and served for two years. Leo Brahn was elected president serving for two years. In January of 1974, during the second administration of Myron Koplin, a decision was made to allow women to be counted toward a minyan. By August of 1974, the congregation approved calling women to the Torah for Aliyot. Rabbi Joseph Weintraub came to our congregation for one year in April of 1975. Isadore Torch was elected president and served 1974-5. Rabbi Robert Kravitz was hired in October 1977 during Leigh Brody’s term as president and new prayer books were purchased for the High Holy Days. The Tree of Life in the foyer was donated by the children and grandchildren of Elsie and Dave Kruger in honor of their 50th wedding anniversary in July of 1978. Sigfried Dayan served as president of the congregation in 1979. In June of 1979, Beverly Kruger was the first woman to be elected president of Sherah Israel. In 1980 the Dr. Lawrence A. Haskins Memorial Trust Fund was established to give scholarships for scholastic excellence to congregational youths between the ages of 10 and 20. In March of 1982, our congregation received a gift of its first Sephardic Torah to honor the life of Roslyn Dayan. Also in March of 1981 the Sisterhood voted to dissolve and merge with the congregation in all activities regarding financial and spiritual aid. In June of that year, Dr. David Frolich was voted president. His first duty was a joyous and momentous one. After one year of study, eight adults (seven women and one man), celebrated their Bar and Bat Mitzvah with the congregation. In December of 1981, Rabbi Irwin Cutler was hired to fill the vacated Rabbi’s position. His appointment was historically significant as his father also served our congregation during the early years. In 1982, the Board of Trustees was established to oversee the General Endowment Fund insuring the future of the congregation. Also, the Mary Glyck-Edelstein Trust Fund was presented in June of 1983. In 1983 Beverly Kruger was elected to the new position of Administrator and served until December of 1994. Harry Haskins was elected president in 1983. During his two-year term, a limited remodeling program began. The Rabbi’s study was enlarged and refurbished. With the endowment of the Sarah Mendel Koplin Library Fund in 1984 we were able to relocate and redesign our library. The Fund permitted a significant enlargement of the library collection, and for the first time a systematic cataloging of all library materials was initiated. During this period three meaningful additions to the Synagogue were made. A Holocaust Memorial Plaque was donated by the Frolich Family and was placed in the sanctuary. The Kessler Torah, smuggled out of Nazi- occupied Austria, was encased in a sealed cabinet and put on permanent display in the Plum Street foyer. In 1985, the David S. Kruger Torah Fund was established for the purpose of maintaining the Torahs and ornaments in the required kosher condition. In 1985 the pulpit was filled by Rabbi Dov Edelstein, and for the second time in our history a woman, Elsie Benn, was elected president. During her administration, a demographic study of the congregation was completed, a Long-Range Planning Committee was established, a Rosh Hashanah Inauguration Service was introduced, and the congregation approved the use of music for Shabbat and the festivals in the Social Hall. The Synagogue Library won the Solomon Schechter Award for Excellence from the United Synagogue. Beverly Kruger became our first member to be elected to the United Synagogue National Advisory Board and the Board of Directors of the Southeastern Region of United Synagogue. In addition, Rabbi Edelstein was chosen by Governor Joe Frank Harris to serve on the Holocaust Commission for the State of Georgia. In June of 1987, Norman Kaplan was elected president and was re-elected in May of 1989. In October of 1989, Rabbi Edelstein consecrated the new Sherah Israel Cemetery on the side of Rose Hill which had been purchased in the mid 1960’s during Melvin Kruger’s administration. After many months of planning and building 253 gravesites were established. In early 1990, when the synagogue was without a rabbi, a group of congregants under the direction of Morris Cohen and David Frolich organized a weekday Tefillin and Torah service. The Thursday morning minyan continues to this day. In May of 1990, due to the untimely death of President Kaplan, Ike Dreizin was elected to serve as president for the remainder of Mr. Kaplan’s term which ended in May of 1991. During his administration, an extensive renovation and remodeling of our building began. Myron Koplin served as Building Committee Chairman. In the spring of 1991 Rabbi Edelstein moved to Israel. Steven Kruger, following in the path of his family, became president of the synagogue. During this time, we were without a rabbi but were blessed to have the spiritual leadership of Rabbi Mychal Springer and Rabbi Ron Muroff who alternated as visiting rabbis. Their inspiration and support enabled us to search and find the appropriate rabbi. During Mr. Kruger’s tenure a total revision of the constitution was accomplished and junior and associate membership status was initiated. Project Isaiah was continued at Yom Kippur and we helped out at the Bibb County Jail Christmas Eve and Day. For the first time in our history the congregation participated in the National Enrollment Program for the Jewish Theological Seminary. At the Southeastern Conference of United Synagogue Mr. Kruger was elected to the Board. We also received the Region Fundraising Award. As the new administration came into office in 1993 with Francine P Kirsh as president, Rabbi Aaron Rubinstein and his wife Sharona joined us with great hope for the future. At this time, a wonderful choir was formed under the direction of Rabbi Rubinstein and his talented wife. Within the community, Sherah Israel was becoming more visible as we hosted our first ecumenical Thanksgiving Service. Our work with Project Isaiah, an ongoing social action project with the Macon Food Bank and our unique Medical Center Christmas Day Volunteer Program and well as multiple holiday celebrations gave us a good deal of media attention. During Mrs. Kirsh’s administration a joint communal Chevra Kadisha was established with Temple Beth Israel. A new Macon Youth Group was formed enabling us to bring together all of the Jewish youth in Middle Georgia in one organization. Our congregation rededicated our auditorium in memory of Gertrude T. Haskins and our education wing in memory of Rachel, Rose and Robert Zarks. In June 1995 Robert E. Chanin assumed the presidency as another second generation followed in the footsteps of his father, L’Dor V’Dor. During the two years that Robert Chanin served a Sunday school was established for the Jewish Youth of Middle Georgia. This school, Macon Talmud Torah, was a joint effort of Congregation Sherah Israel and Temple Beth Israel. Also, during Mr. Chanin’s administration a permanent building fund assessment was established to insure that the maintenance of the synagogue would be endowed. In 1997 Gerald Marshall was elected president becoming the third generation of his family to serve in this capacity. During Mr. Marshall’s administration, the note for the remodeling of the synagogue was paid in full. Also a new computer system was installed, increasing the efficiency of billing and collection of information. Terri Frolich began her term as president in 1999. In August our synagogue hosted over 300 teens from the USY Leadership Training Institute (LTI) on their way to Ramah Darom in north Georgia. Other noteworthy events included: establishment of a Web site and email list; for two years the artwork of congregant Laurel Robinson was featured in the United Synagogue calendar; high holiday maftirs and aliyahs were open to the entire congregation; a Centennial Committee was formed to begin planning for our celebration in 2004; and our Community Outreach Program expanded to include the collection of food for the food bank and providing monthly volunteers to help feed the hungry at Mulberry Methodist Church. During Mrs. Frolich’s administration the congregation decided to return to our kehilla’s original name, Sha’arey Israel. In December of 2000 a beautiful new ark curtain was presented to for the synagogue’s main sanctuary donated by Bess and Arnold Cotton. In 2001 Evan Koplin was elected president of our congregation becoming the second generation in his family to serve in this role. Responding to needs for increased security Mr. Koplin designed a security plan for all synagogue functions. 2002 was a great year for Adult Education. Author Rabbi Daniel Gordis addressed our kehila during our scholar in residence weekend. Sunday morning BLT (Bagel Lox & Tephillin) grew into a weekly torah study class. In March of 2002 Abe and Edythe Cohen generously provided the funding to purchase an antique Sephardic Torah which had originally been scribed in Iraq. Sheila Elkon was elected president in 2003. During her administration Congregation of Sha’Arey Israel celebrated its centennial year. Temple Beth Israel and Congregation Sha’Arey Israel decided to disband Macon Talmud Torah. Also in 2005 an anonymous donor gave our new Wall of Jerusalem. June 2005 saw Shelley Davidson elected president and we bid Rabbi and Sharona Rubinstein goodbye as they moved their family to Memphis, Tennessee. During Davidson’s administration, and with the hard work of Evan Koplin’s Rabbinical Search Committee, Rabbi Bat-Or was hired as our congregation’s first female Rabbi. In July 2007, Marty Koplin began her presidency and Rabbi Bat-Or began her first year as our rabbi. Sha’arey Israel served as the pilot for the Cantorial Assembly’s internship program which provided our congregation with periodic visits from a student cantor. Rabbi Bat-Or continued our popular Wednesday Linch & Learn program as well as other adult and student education programs. In the Fall of 2008, art professor and congregant Laurel Robinson brought a mobile glass blowing studio to CSI and our congregants and religious school students had an opportunity to learn about Kristallnacht and then to create glass objects of their own. In the Spring of 2009 the Adult Education Committee brought Scholar-in-Residence James Bowley for a very informative weekend. In June of 2009, Dr. David Frolich returned to the CSI presidency. Our congregation was thrilled to have Cantorial student Izzie Gordon enhance our High Holiday services with his beautiful voice. Under Dr. Frolich’s leadership our monthly newsletters were made available via email, our members could now pay bills with credit cards and our security system was updated. Thanks to the generosity of the Kruger Family and the Kruger Torah Trust, CSI received a beautiful new Torah. Congregants were able to witness the last several lines of the Torah being written by the Atlanta scribe, Rabbi Danneman. In the Fall of 2010 we added a Noah’s Ark Wall where anyone can buy a brick to honor our students. Our courtyard was transformed into a beautiful garden thanks to the generosity of the Rachel Mishaneyah Cohen Family. Cantorial Intern, Russell Jayne, visited our congregation several times throughout the year enhancing our services with his delightful voice and personality. Spring of 2011 brought a major renovation of our kitchen and we wished Rabbi Bat-Or well as she returned to California. In June 2011, Shelley Davidson returned to serve her second term as President of our Kehilla. During her term, many changes took place including a complete revision of the Religious School Handbook and the Bar/Bat Mitzvah Standards and obligations. She also headed the committee to inquire and pursue rehiring Rabbi Aaron Rubinstein as our spiritual leader. With pre-approval of the Congregation, she negotiated a contract with Rabbi Rubinstein and with the help of then Vice President, Anne Bayme, helped make possible the Rubinstein family’s return to our Kehilla. In June 2013, Anne Bayme was elected as president of CSI for a two year term. We also welcomed Stephanie Johnson as our new secretary. In preparation for Rabbi Aaron Rubinstein and his family returning to Macon in August, extensive work was done at the parsonage to upgrade and update. Rabbi Rubinstein added music to our Friday night service, re-instituted the choir, initiated monthly Drum Circles after Friday night services, and developed the adult education programs, Davanology and Limmud. The Cohen Garden was completed with a beautiful “cherry blossom” iron gate designed by Laurel Robinson. New carpeting was put in the library, Rabbi’s office, and Chapel; a new phone system was installed; fire extinguishers and EXIT signs were replaced or updated, and the entire building was rekeyed. We hosted”Grandma” Fay Tennebaum, and enjoyed her film, The Cake Lady, and we hosted Rabbi and author Miriyam Glazer as our Scholar-in-Residence. CSI’s Kadima and USY clubs continued to flourish, as did our religious school. Our students planted two trees in Tatnall Square Park. Junior Congregation was moved to Sunday mornings once a month. A once a month Sunday School class for four year olds was initiated. Also new and very successful was “Rockin’ Shabbat”, a one a month Shabbat program, service and dinner for young children and their families. In June 2015, Theresa Rosengart was elected as President of CSI for a two year term. Highlights so far include much needed maintenance to Congregation Sha’arey Israel’s various properties. The elements had taken their toll on our synagogue’s six wooden Main Sanctuary doors on the First Street entrance and they were beautifully restored so they not lost beyond repair. At the parsonage, a house over one hundred years old, the structural supports were reinforced to stabilize the building. Additionally, the outside of the parsonage recently received a pressure cleaning and a much needed new paint job to protect the exterior. Maintenance also took place at the Old Section of Rose Hill Cemetery where the unexpected fall of a massive tree after a storm caused damage. In August 2016, our new prayerbooks for the chapel, Siddur Lev Shalem arrived for Shabbat services. This wonderful, user friendly siddur with modern syntax and many extras has enhanced our davening experience while respecting tradition. A meeting at the shul with the Southeastern representative from USCJ (United Synagogue of Conservation Judaism) was arranged for the Board and some past Presidents to work together. The focus was to identify both CSI’s strengths and areas of challenge to better address the needs of our kehilla now and for the future. Our website has also been upgraded to a WordPress format that will make it easier to develop and expand with content.